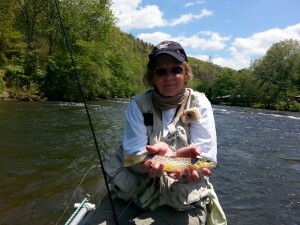 Learn to fly fish the Black Caddis hatch on the Tuckasegee River can pay off big dividends for hungry trout! The delayed harvest section of the Tuckasegee River flows right the middle of downtown Bryson City, NC. The warmer days in early March helps to jump-start the season of epic black caddis hatches! The newer stockings of hatchery fish adjust to this activity within a few days. The preferred method to employ is double or even triple flies that focus on fishing the film. If you spend a little time adjusting to fishing the film it will pay off big dividends early in the year with surface fishing. Rig the three patterns up with the best floating fly on the point. I prefer the low riding caddis emergers to be rigged as droppers. This enables me to control the current lanes I am focused on to a target. Typically folks rig the best floating fly on the top dropper. This rigging method is difficult to know the position of the other caddis emergers in the film. This decision for me tends to depend on water types. With laminar flow currents, I have the high floater on the top dropper verses broken turbulent water like pockets and riffles where I find it easier to use the high floating dry on point. 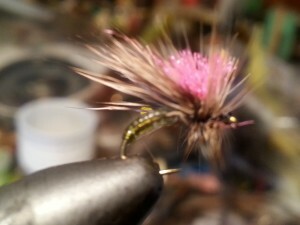 Charlie Craven’s pattern the “Clown Caddis” is a highly visible pattern! Great for guide trips because it is easy for folks to locate on the water. It floats well and often the abdomen rides down in the film. The CDC caddis is a great pattern for visibility (pictured above) which floats a 3mm tungsten bead. 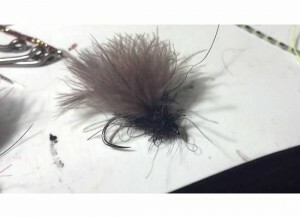 Treat the dry fly with some special sauce like “Frogs Fanny” or “Dry Magic”. I usually employ Gary LaFontaine’s “Sparkle emergent pupa” as an emerger. The other emerger is usually one of many attractor patterns which are based on the amount of light and water clarity. Be sure to check out the Hatch Report for other times of the year! Happy fishing and tight lines!